Detail from "Our Women in the War," wood engraving by Winslow Homer in "Harper's Weekly," September 1864. The American Civil War was one of the deadliest periods in American history. Over 600,000 Americans perished during the conflict, more than all other US wars combined. With many of the nation’s men off fighting, women at home looked for ways to contribute to the Union cause. The same patriotic urge that sent men to war was also felt at home, but women could not go off to battle. Instead, many became nurses, tending to the injured and battered; others took a different approach to aid. 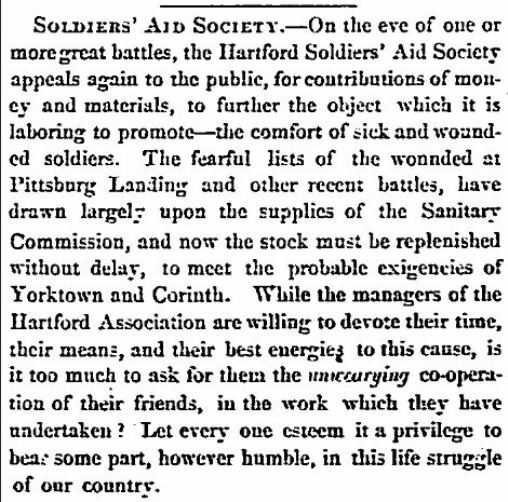 One such example came from Connecticut’s women in the form of a massive charity organization—the Hartford Soldiers’ Aid Society. 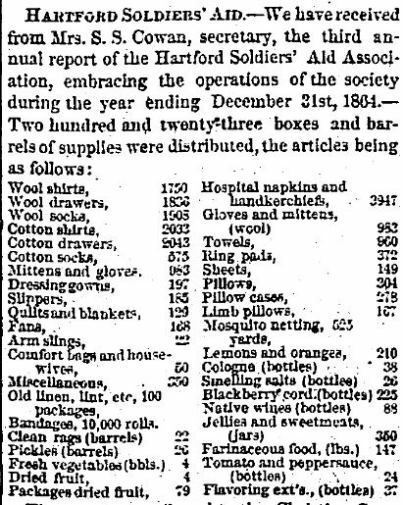 Composed almost entirely of women, the Hartford Soldiers’ Aid Society banded together charity organizations from around the state and funneled goods directly to soldiers both on the field and recovering in hospitals. Heralded at the time as a remarkable feat of patriotism, the Soldiers’ Aid Society provided an outlet for women to not only help the troops, but also to operate one of the largest charity organizations in the country. Detail from an editorial printed in the Hartford Daily Courant, April 23, 1862. The effort proved a rousing success. People donated clothing, towels, pillows and pillow cases, boots, food, blankets, medical supplies, money, alcohol, and countless other items. Churches also saw the opportunity to contribute, making up almost half of the total funding for the society in 1861. Under the advisement of Governor Buckingham, the Soldiers’ Aid Society split-up donations among towns, assigning specific towns to provide goods to specific Connecticut regiments. Participating towns set up donation centers(run almost entirely by local women volunteers) that provided greater access to potential donors. The society eventually grew large enough that many doctors on the frontlines began to recognize its name. To correctly gauge the demand for certain goods, Cowen and company asked many of these doctors to put in requests for what they needed most. This communication allowed the Soldiers’ Aid Society to ask for certain goods in their monthly reports. With these networks established, organizers had an efficient system of collection and distribution that lasted for the remainder of the war. It will be the source of lasting happiness to the noble women who have given so much time to this far-reaching charity, to remember hereafter the beneficent part taken by them in the war for the Union. Already the Legislature of Connecticut has in suitable terms thanked the patriotic women for their services, in ministering to the welfare of its defenders; the soldiers, with hearts overflowing with gratitude; have thanked them; and future generations will thank them, recording their acts of personal sacrifice and generous devotion to stimulate those who come after to the practice of similar virtues. When the society’s last meeting closed, members announced to the managing body that $2,962.37 had been raised from January to June alone, an amount Cowen never imagined her charity organization reaching (especially considering that in its first six months the society only took in around $500 in cash donations). 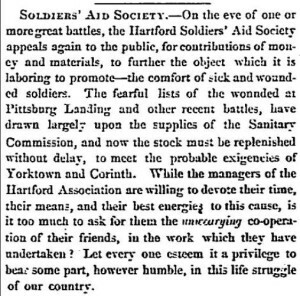 Detail from the third annual report of the Hartford Soldiers’ Aid Society from the Hartford Daily Courant, February 11, 1865. In retrospect, it may seem as though the Hartford Soldiers’ Aid Society served as just another domestic outlet for women to participate in the war effort. When examined more closely, however, much more becomes clear. 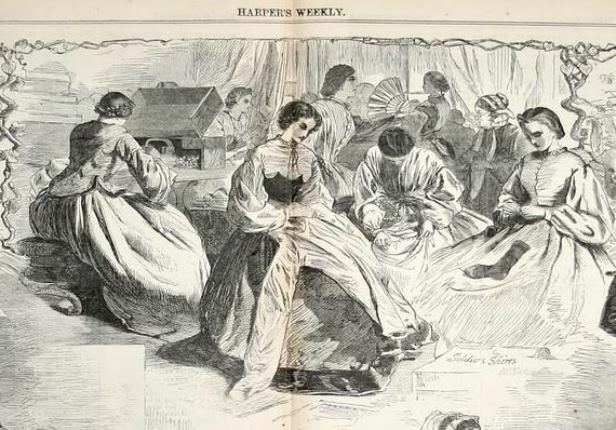 Even if the charitable aspects of the organization reinforced traditional roles for women during times of war, the Hartford Soldiers’ Aid Society provided an opportunity for Connecticut women to run an organization without the leadership of men. These women may have been influencing the war by acting within the limitations of the domestic sphere, but their success helped promote increased opportunities for women to take on responsibilities outside the home. The need for aid allowed women to take up managerial positions, something normally not afforded to them in times of peace, and the manner in which these women operated the society became a shining example of women excelling at more than just managing a household. Hines, Blaikie. Civil War Volunteer Sons of Connecticut. Thomaston, ME: American Patriot Press, 2002. Niven, John. Connecticut for the Union the Role of the State in the Civil War. New Haven, CT: Yale University Press, 1965.